Chapter 2. A declining middle-income class? Chapter 3. Where have the middle class jobs gone? The OECD has been at the forefront of documenting the rising levels of income inequality, the lack of opportunities that many OECD countries have experienced over the past 30 years. Through its analyses and publications, the OECD has shown the extent to which middle-income households – the focus of this report Under Pressure: The Squeezed Middle Class – in many OECD countries have seen their standard of living stagnate or decline, while higher income groups have continued to accumulate income and wealth. A strong and prosperous middle class is crucial for any successful economy and cohesive society. The middle class sustains consumption, it drives much of the investment in education, health and housing and it plays a key role in supporting social protection systems through its tax contributions. Societies with a strong middle class have lower crime rates, they enjoy higher levels of trust and life satisfaction, as well as greater political stability and good governance. However, current findings reveal that the top 10% in the income distribution holds almost half of the total wealth, while the bottom 40% accounts for only 3%. The OECD has also documented that economic insecurity concerns a large group of the population: more than one in three people are economically vulnerable, meaning they lack the liquid financial assets needed to maintain a living standard at the poverty level for at least three months. We have also found that children born to parents who did not complete secondary school have only a 15% chance of making it to university, compared to a 63% chance for children whose parents attended university. Health outcomes, and even life expectancy, are also heavily influenced by socio-economic background. These findings have prompted governments to take action to redress a situation that has become economically and politically unsustainable as it undermines public trust in policy and institutions. For its part, the OECD has called for a new growth narrative that puts people’s wellbeing at the centre. Its New Approaches to Economic Challenges and Inclusive Growth initiatives aim to upgrade the OECD’s analytical models and measurement tools, to better understand the functioning of our economies and promote policies that integrate considerations of equity ex-ante. The OECD has also developed a Framework for Policy Action on Inclusive Growth, which offers governments concrete guidance on how to design and implement policies that will give all people, firms and regions the opportunity to thrive – particularly those that are struggling or have been left behind. The OECD has also placed the issue of inequalities and the need for inclusive growth at the heart of the international agenda, where it has helped inform the work of the G7 and G20. 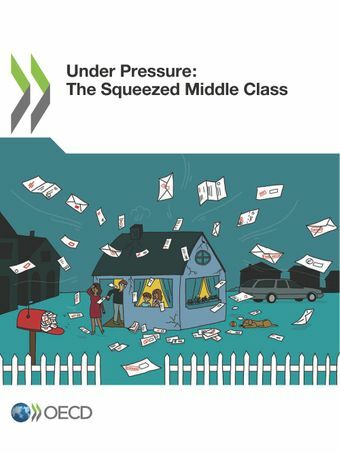 Under Pressure – The Squeezed Middle Class is the fifth in a series of OECD flagship publications on the trends, causes and consequences of inequality and the remedies needed to address them. Growing Unequal? (2008) and Divided we Stand (2011) analysed the key features and causes of trends in rising income inequality in advanced and major emerging economies. In It Together (2015) looked at the consequences of inequality, including its effects on economic growth, the role fiscal consolidation and redistribution policies have played in shaping these trends, and the way in which structural changes in the labour market have impacted on household income inequality. The OECD’s most recent report in this series, A Broken Social Elevator? How to Promote Social Mobility (2018) highlighted the increasing lack of social mobility in our societies. For instance, in OECD countries, it would take between four and five generations (or up to 150 years), for a child born into a low-income family to reach the average level of income. In this respect, it is clear that socio-economic status still heavily influences income and employment prospects, job quality, health outcomes, education, and other opportunities. Under Pressure – The Squeezed Middle Class provides an in-depth focus on the current situation of the middle class as an economic and social group. In doing so, it documents the pressures and growing risks building up on this group. Indeed, over the past 30 years, middle-income households have experienced dismal income growth or even stagnation in some countries. This has fueled perceptions that the current socio-economic system is unfair and that the middle class has not benefited from economic growth in proportion to its contribution. Furthermore, the cost of living has become increasingly expensive for the middle class, as the cost of core services and goods such as housing have risen faster than income. Traditional middle-class opportunities for social mobility have also withered as labour market prospects become increasingly uncertain: one in six middle-income workers are in jobs that are at high risk of automation. Uncertain of their own prospects, the middle class are also concerned about those of their children; the current generation is one of the most educated, and yet has lower chances of achieving the same standard of living as its parents. The report documents these trends in detail. It shows that every generation since the baby boom has seen the middle-income group shrink and its economic influence weaken. Three decades ago, the aggregate income of all middle-income households was four times larger than the aggregate income of upper income households; today, this ratio is less than three. The chapters look at whether there is a declining middle class, why middle-class jobs are disappearing and the rising costs of the middle-class lifestyle. The final chapter presents policy measures and initiatives that will improve prospects and opportunities for the middle class: improving fairness in the taxation system, addressing the increasing cost of living both on housing and education markets, building the skills of middle-class households, reducing risks of over-indebtedness and improving access to business opportunities. By shedding light on the situation of a group that has traditionally been the main driver of economic growth and a pillar of social stability, this report makes a key contribution to the OECD argument and vision for inclusive growth. We hope it will continue building a strong case for policy action, help countries develop policies that alleviate the pressures on middle-class households and create economies that fulfil the “middle class dream” once again.